Title: 06/14/1993 - Labeling requirements of hazardous chemicals. Thank you for your letter of April 28, on behalf of your constituent Ms. Barbara Dietrich, addressed to the Occupational Safety and Health Administration (OSHA), on the labeling requirements of hazardous chemicals under OSHA's Hazard Communication Standard (HCS), 29 CFR 1910.1200. MAKE THE RATING AND LABELING OF HAZARDOUS PRODUCTS, as required by the OSHA Hazard Communication Standard of August 24, 1987, (29 CFR 1910.1200) THE RESPONSIBILITY OF THE MANUFACTURER OR DISTRIBUTOR RATHER THAN HEALTH CARE PERSONNEL. Ms. Dietrich's letter indicates that Dr. Dietrich's office is labeling all hazardous chemical containers. As previously stated, original hazardous chemical containers are required to be properly labeled by the chemical manufacturer, distributor, or importer. However, if in Ms. Dietrich's dental office a hazardous chemical from a labeled container is transferred into another container and the chemical is not intended for the immediate use of the employee who performs the transfer, then the employer must ensure that the new container is labeled properly. 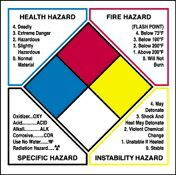 This handy poster explains the common hazardous chemical labeling systems. Get yours at Safety Emporium. The HCS allows the employer to use an alternative labeling method as long as the written Hazard Communication Program adequately addresses the issue. Examples of alternative labeling methods are the Hazard Material Information System (HMIS), National Fire Protection Association (NFPA), and American National Standard Institute (ANSI) systems. Ms. Dietrich's letter indicates that the office is using an alternative labeling method that includes a rating system and that this system is burdensome. The standard does not require employers to use hazardous chemical rating systems. Again, if the incoming container is already labeled by the chemical manufacturer, importer, or other responsible party, then the employer is not required to affix his own label. If the container does require labeling by the employer, then either the alternative labeling method or a label containing the chemical identity and an appropriate hazard warning shall be used. The purpose of container labeling is to provide an immediate warning to employees of the hazards they may be exposed to and through the chemical identity, labels provide a link to more detailed information available through MSDS's and other sources. Labeling of containers of hazardous chemicals is an essential element of an employer's Hazard Communication Program. Accordingly, OSHA views the labeling requirements as essential elements of the standard that are not duplicative or burdensome to the employer for the reasons presented above. We welcome any further comments that Ms. Dietrich may have concerning the HCS or occupational safety and health issues in general.